Light gold colour with a pleasing green cast, this reposado from Arandas in the Highlands opens with a deep nose of agave, olive and green herbals. Bold and forceful in the mouth, the agave and sweet earthy flavours dominate – smoke, wood and minerals present later. 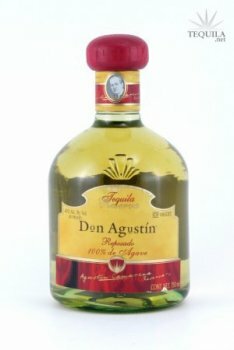 Don Agusti­n fades reluctantly and slowly, leaving a soft bitterness and a lingering taste of agave, green herbals, pepper and minerals. This is a modestly packaged and VERY modestly priced reposado. It is complex, flavourful, powerful, and imminently satisfying. Carefully crafted, this tequila offers a most excellent value. Nice sweet aroma of honey/caramel, mild vanilla, and floral. Sweet honey/caramel, butter, and green olive initial taste with a hint of bitterness. Almost reminded of a cross between Bit-O-Honey candy and a dirty martini. Other notes include wood and smoke. The finish is smooth with a subtle bitter, spicy, peppery and wood caramel finish. Not bad for around $25. My limited experience on repososados includes Don Julio, 1921 Especial, Clase Azul, and Corralejo. I would say that this is a great deal but I’m totally stuck on the 1921 and really like the Clase Azul (but it’s out of my price range). We’ll see how the battle plays out between my pocket book and my palette. As of this writing and limited experience, I’d give this a B+/A- rating. Initial Taste: a semi oily mouth feel. It was sweet upon entry, with an ever so slight bitterness. First taste was caramel. Body: A very nice body of agave, with compliment of earth, spices, caramel and vanilla. Pretty complex! Finish: A semi heated finish of medium duration with a lingering aftertaste of spice and caramel.